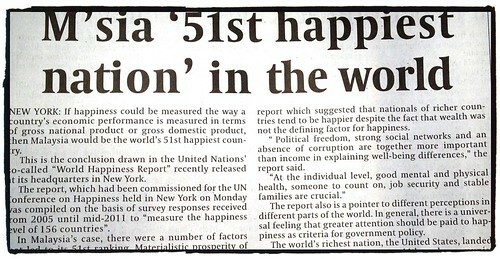 Recently the United Nation released the 'World Happiness Report' at its headquarters in New York and if UN's yardstick is to go by, Malaysia would be the world's 51st happiest country. Not that bad considering there were altogether 156 countries surveyed in this report. Malaysia was ranked second in Southeast Asia, behind Singapore (ranked 33rd globally). Other SEA nations surveyed include Thailand (52nd), Myanmar (74th) and Indonesia (83rd). Togo - the 'least happy' country. So, where would you like to live (if it was up to you)? Denmark or Finland? Then again, it boils down to individual good mental and physical health, job security, stable family and someone to count on that could be more important than mere wealth. Be content and always give thanks. interesting for sure! we were just looking at the pictures from our Scandinavian trip last night...and talking about how expensive everything was there! and also how nice everyone was too!! Neither, unless of course if I live in Togo..lol. I agree that it boils down to individual good mental and physical health etc. I would be happy any where as long as I have a stable family and someone to count on, good friends. What if I am happier, and you are a little bit happier, can Malaysia be happier? @rainfield61. Definitely. One more happier person should make the whole population happier. Unless of course, if the statistics was based on a small sample that would've essentially omitted you and me from the equation.